When Marvel first announced Marvel Rising, its new foray into animation, it looked to deliver something largely missing from the big-screen MCU: a focus on the comic publisher’s younger crop of heroes, especially the women and people of color mostly relegated to sidekick status when it comes to the live-action films. Beloved characters like Ms. Marvel and Squirrel Girl may have yet to appear in the flesh, but with Initiation, a series of six four-minutes shorts that set the stage for the feature-length Marvel Rising: Secret Warriors film coming later this fall, Marvel is beginning to do right by these characters—and the audience eager to see them onscreen. Animated short. All six shorts watched for review. Make no mistake: These are animated shorts aimed squarely at a tween demographic, with the attendant simplicity in form and execution (and length—each of the six initial installments clocks in around four minutes long). But the narrative doesn’t shy away from the grounded life-or-death stakes kids and adults alike would expect from the source material. 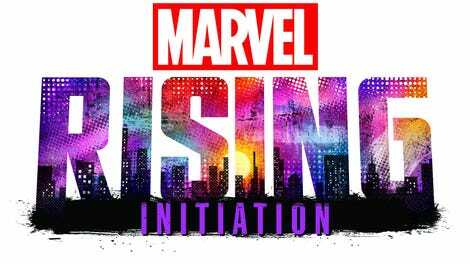 Marvel Rising: Initiation follows Gwen Stacy, a.k.a. “Ghost-Spider” in this mini-universe’s tweaking of the comics’ Spider-Gwen, so named for being the version of Spider-Woman in an alternate reality in which Peter Parker’s first love, Gwen, survives and becomes the one imbued with Spider-powers. Still a normal high school kid who plays drums in a band (with her friends Mary Jane Watson, Betty Brant, and Glory Grant), she’s a masked hero by night, her identity unknown even to her police-chief father, Capt. George Stacy. 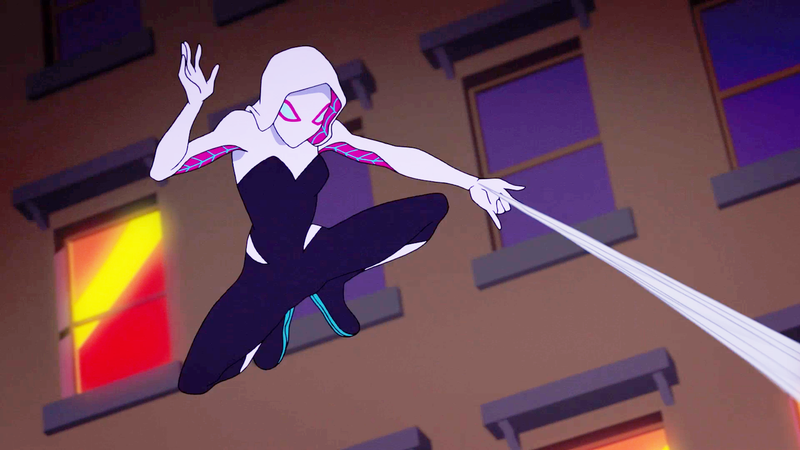 To its credit, Initiation doesn’t waste time belaboring introductions to these characters, instead throwing the viewer straight into a narrative in which the police are hunting Ghost-Spider (Dove Cameron, who also voiced Spider-Gwen in Ultimate Spider-Man), now an outlaw wanted for supposedly killing an innocent teen (Gwen’s high-school BFF Kevin). The series doesn’t shy away from this death, taking its time before revealing the backstory that led to the public and police turning against the web-swinging vigilante. Stacy calls in S.H.I.E.L.D. agents Quake (Agents Of S.H.I.E.L.D.’s Chloe Bennet) and Patriot (Kamil McFadden), and by the end of the combined 24 minutes, Ghost-Spider has butted heads with the agents, tussled with Ms. Marvel (Avengers Assemble’s Kathreen Khavari) and Squirrel Girl (Milana Vayntrub, also playing the character in the New Warriors show that’s supposedly still happening), and set the stage for what will presumably be part of the plot for the forthcoming Marvel Rising: Secret Warriors full-length film, due out in the fall. The high points of the shorts are, unsurprisingly, provided by the actors who have already had some experience giving voice to their characters. Cameron makes for a brashly likable Gwen, all adolescent bravado and brushed-aside insecurities, while Khavari delivers on Kamala Khan’s pragmatic wit. The best newcomer is Vayntrub, who takes Squirrel Girl’s bubbly stream-of-consciousness logorrhea and makes it come alive. Bennet and McFadden’s vocal performances are a bit uneven, though in fairness they don’t have much to work with here, the former’s Daisy Johnson basically relegated to cameos in the first and last entries, and the latter stuck delivering one-note heroic bluster. The overall storyline is squarely on Gwen’s efforts to find Kevin’s real killer and clear Ghost-Spider’s name, but it doesn’t really come alive until the third episode, when the team-up between Ms. Marvel and Squirrel Girl kicks in. This is where the show also reveals a willingness to get meta with its humor and imagery, as Squirrel Girl unleashes her squirrel sidekick Tippy-Toe to take on Ghost-Spider in a manner reminiscent of old Hanna-Barbera cartoons, and Doreen’s suggestion to Kamala that they fight “anime-style” leads to some entertaining adjustments to the visuals. Coupled with Squirrel Girl’s penchant for self-narration and some nice hero-vs.-hero moments of splash-page-worthy animation, the series shows real potential for an inventive and big-hearted mini-universe of Marvel superheroes. It’s difficult to say whether the installments reveal a creative spark moving in the right direction; with only six shorts, each one barely several minutes long, there’s simply not much here as of yet. And while the characters are mostly appealing and the breezy-but-busy tone keeps things moving, it’s anyone’s guess as to whether a feature-length film targeting a younger demographic will manage to sustain the interest of older fans looking for a story engaging enough to roll with the periodically reductive narrative and characterization. But for anyone who’s been waiting for Marvel to get a bit more diverse and inclusive—and just as importantly, get some of its best current characters onto the small screen—this is a promising start. Frustrated by superhero comics? The Unbeatable Squirrel Girl will save you!